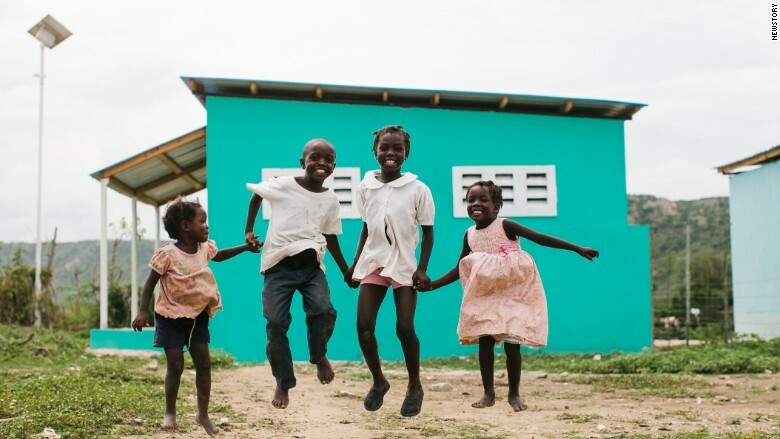 New Story is helping to repair the Haitian economy, one home at a time. Not every Silicon Valley startup is seeking a billion-dollar valuation. A nonprofit called New Story has a different goal: $1 million in donations. New Story is funding sustainable homes for those who've been displaced due to a natural disaster. New Story, which launched in December, is a combination crowdfunding platform and urban planner. It partners with local nonprofits to vet families like Charite, a mother of five who moved into a tarp tent after the 2010 Haitian earthquake. It was too small to fit her whole family so she's been separated from two of her children for more than five years. New Story raises money for one family at a time -- right now, that's Charite -- with a goal of roughly $6,000. That's how much it costs to build a home with basic concrete blocks and a tin roof, according to Alexandria Lafci, one of four cofounders. 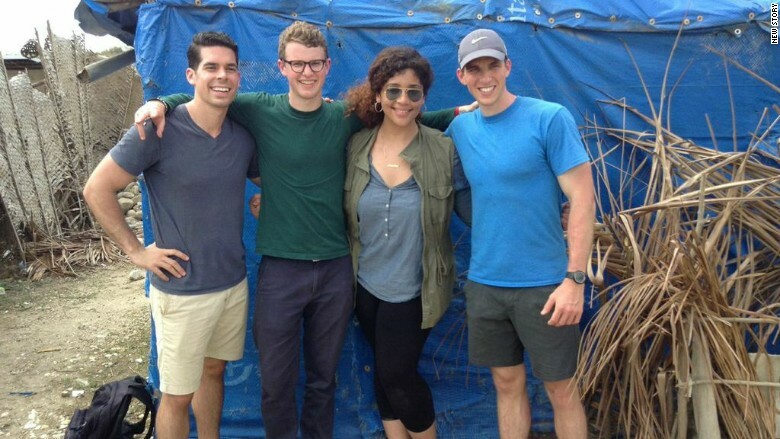 New Story cofounders in Leveque, Haiti -- the first country they're helping with their nonprofit startup. It's no secret that some venerable charities don't funnel all donations into actually helping those in need -- much of those funds go toward operational costs for the nonprofit. So New Story is taking a different approach: complete transparency. It raises two different pools of funding: One for the families and one for New Story's operational expenses. New Story has raised $500,000 for operations, all of which goes toward overhead. Separately, it has raised roughly $800,000 for families. Donors can see how those funds break down -- what went toward timber, cement, roofing materials, etc. Lafci said New Story isn't trying to replace existing organizations. "One thing we pride ourselves on is our model of working with local nonprofits," said Lafci. "They're uniquely positioned to enact social change on the ground." In Haiti, the first country it's focused on, it has partnered with Mission of Hope, which has over 15 years of experience working in Haiti. Mission of Hope helps to screen families and connect with local contractors to build the homes. "We work with people who have the trust of the communities they're helping," said Lafci. Partnering with local organizations also makes it easier to gain the trust of local governments. Lafci said the Haitian government is much more open to selling or giving land to local organizations that have demonstrated an interest in rebuilding. New Story built 102 homes in Leveque, Haiti, in 100 days -- and all of the families own the homes and the land it sits on. This is a stark contrast to the six homes the Red Cross built in Haiti. New Story -- which relocated from Atlanta to San Francisco last month -- is one of 15 nonprofits that have participated in Silicon Valley's elite Y Combinator accelerator. "A home means a lot more to people than just roof over their heads," said Kate Courteau, a partner at Y Combinator. "It is stability and allows them to address finding work. We thought the idea [for New Story] was a bit of a no-brainer." Like other Y Combinator companies, New Story is focused on having as big of an impact as possible. It's continuing to crowdfund for homes in Haiti and plans to announce a second market in November.